A few weeks back it was about 9:30PM and I was craving something warm and comforting to eat. Given that most restaurants close around 9:00PM, Diane, Teresa and I found ourselves checking out the snacks at a bubble tea cafe. 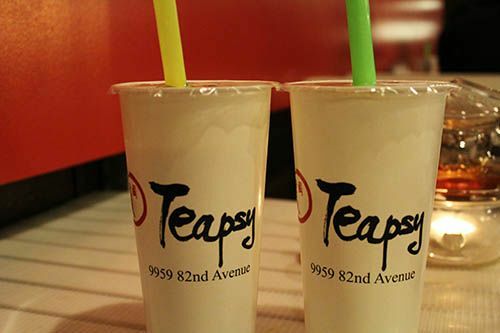 Like most bubble tea places in the city, Teapsy was quite full on a Friday night. Tables were full of patrons enjoying bubble tea and playing card games and we were lucky to snag one of the last open tables. The space is small and cozy with red accents and artwork placed around the dining area. Upon opening the menu it was quite clear that Teapsy's specialty is their drinks, and there were numerous combinations available for to choose from. 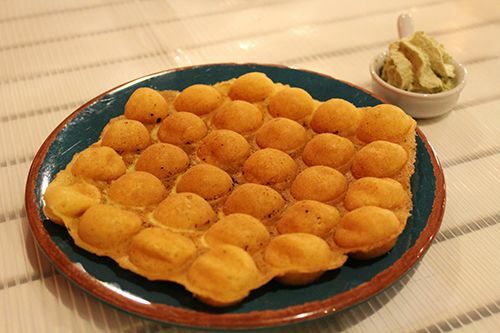 We started off with some Egg Puffs ($5.50) which are an Asian snack favourite. Typically served as a street food with a crust and a bit of a cakey interior, they're the Asian equivalent of the Belgian waffle. At Teapsy, the waffle is golden and served with some matcha whipped cream. I was so excited to dig in until I picked up a small piece - it was soggy and definitely not freshly made. If anything, it was made earlier in the day and microwaved to a lukewarm temperature. Needless to say, it was not an impressive start. 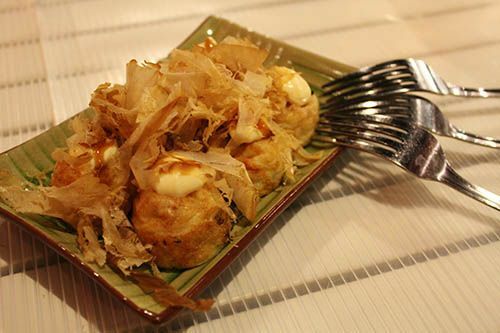 Takoyaki ($5.50) is another popular Asian snack in which octopus pieces are cooked in a batter and topped with bonito flakes and various condiments. We had hoped the takoyaki would be made in house as it is fairly simple to make, but these were prepackaged then plated. Again, the takoyaki was made earlier in the day and reheated to a lukewarm temperature before being served at the table. From a food safety standpoint, Teapsy really doesn't do a good job of fully heating up their food. The flavour was good but I was so unimpressed at this point with the microwaved food. We also ordered the Homemade Wontons with Spicy Garlic Sauce ($5.50) which turned out to be better. See what happens when you actually make the food in house? 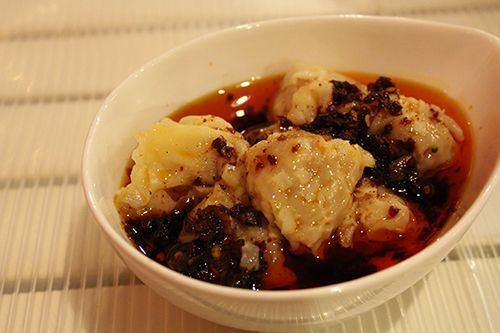 The wontons, however, were overcooked, leading them to be very firm with an extremely sticky skin. The wontons themselves had very little flavour, but the oil they were served in had enough heat and garlic to flavour the dish. Without it, this dish would have been another dud. 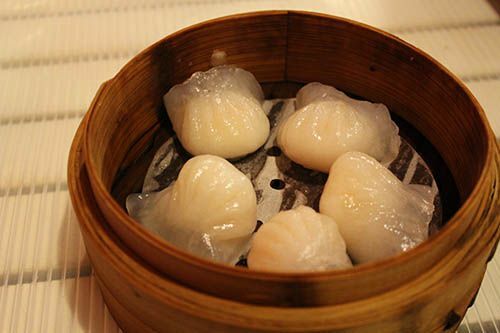 Teresa ordered the shrimp dumplings ($5.50) to satisfy her dimsum craving, and we already guessed beforehand that they were going to be store bought. Our suspicions were right, and the shrimp dumplings had very little flavour. On the plus side, they came to the table piping hot. To go with the food, I had ordered the Pudding Milk Tea ($5.25) which is supposed to be one of Teapsy's special drinks. I expected it to be creamy with a custard flavour, but my drink ended up quite watery with a few small pieces of custard here and there. The custard chunks didn't add much to the drink, and after the first sip I instantly knew I should have ordered my go-to green tea. Oh well! 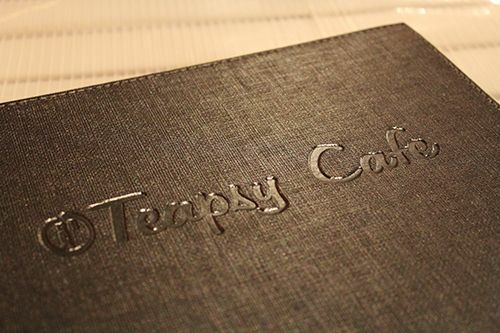 Unfortunately the late-night trip to Teapsy Cafe was a huge disappointment. If the food been served properly to food safety standards it would have been better. The cafe does feature shaved ice and a waffle that I'm interested in checking out, but whether I'm open to giving this place another shot is pretty slim. Has anyone else been there and had a better experience? Let me know! omg, super super yummy! I've yet to eat those puff snacks if you'd believe me! I really love the chilli oil wanton! My favorite! i can buy frozen dim sum and heat up myself! Food safety is very important. That's ashame they don't follow guidelines. So disappointing. Haha, I love mine with extra bubbles!